A fancy pattern slim fit fashion shirt is always a fashion item which is good to wear when you're going out at night or any evening event and if you like them with flip cuffs, Steven Land makes the fancy style slim fit fashion shirt for you. 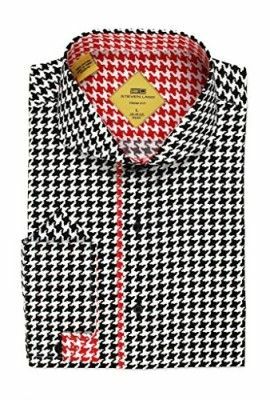 This black houndstooth pattern fashion shirt features a classic spread collar and flip up cuffs to make your style come alive if you are wearing a black suit or even a grey color suit. Fabric is pure 100% Cotton.